This post comes after a small break, I think almost after two weeks. Our internet was was fully down almost for two weeks. So I had been off browsing, getting a bit more time to cook and I had been making some of my favorite typical 'Thalassery dishes' these days. I'm glad that my internet is up and running good and I can share some of those lovely recipes here. So here I'm sharing the 'Ari Unda' a very nice evening snack which kids and adults like to munch alike. Ari Unda, ufff a lot of memories connected with this snack. Snack that is made with roasted rice, freshly grated coconut and dark brown Jaggery- just three ingredients and your snack is just yummy. This is one of my favorite snack, wait.. wait... my favorite snack?? What about my dear big bro then, the most naughty and loved fellow of our home. My grandma used to store the snacks in our little store room, till she figured out some of them missing by its own. She started moving them to her so thought to be 'more secure' places like kitchen, store room and even in the rice/lentil containers by digging them inside the rice(Those containers used to be big Aluminium one's called -Chembu) but all were in vain. My bro who runs back home in the middle of his cricket matches/swimming/cycle racing and much more games just picks up some of them and munch it every time he passes that corridor. And Ari Unda was one of his favourite snack, even after being grown up I have seen him having it with the same passion. 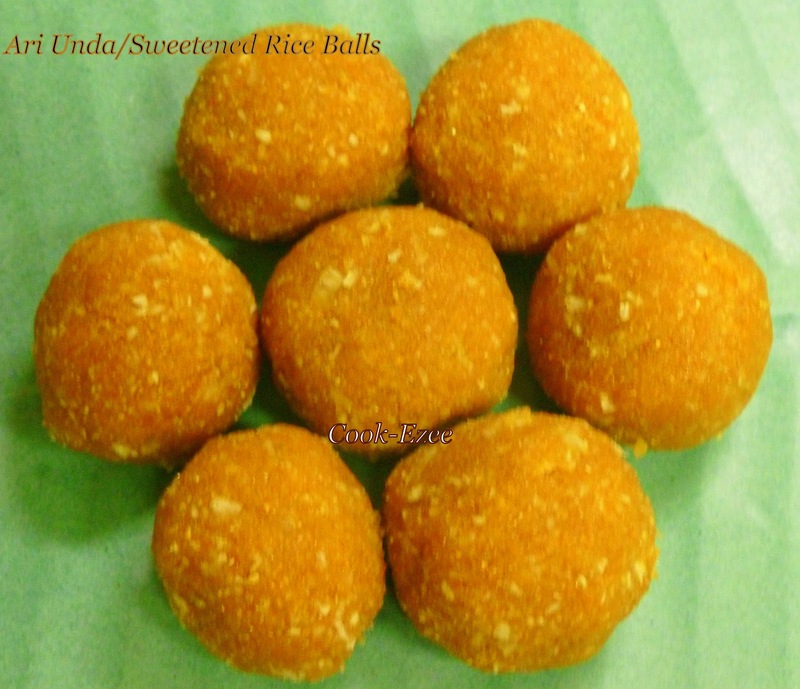 Back in Kerala Ari Unda/Rice balls are made by roasting the rice and pounding them in 'Ural' - a wooden piece almost cylindrical in shape with a round opening on top with some depth to hold rice, with 'Ulakka' - a long piece of wood to crush the rice to powder. It is actually a bigger form of Mortar and Pestle which we use in our Kitchen. My grandma, Mom and aunts used to make it together by chit chatting, seeing them doing it is really a wonderful sight even though the process was hard and required lot of manual labor. Those were childhood memories,now I still see them being prepared in the same way as then when my brother goes abroad and also when I start packing up my baggage to US. Without making Ari Unda before a day of my travel back from India is almost like an in-complete ritual and yea my grandma and mom makes two or three very big Unda/Balls, wrap them in banana leaves and again wrap it in newspaper taking utmost care and love not to break them or get spoiled till I reach here. So friends those were some beautiful stories from my memories about Ari Unda/Rice balls. I have tried my best to match up with traditionally way of making it and give them the awesome authentic taste of Ari Unda. So lets Enjoyyyyyyy making this awesome snack!!!! Heat up a frying pan/Kadai/Wok. 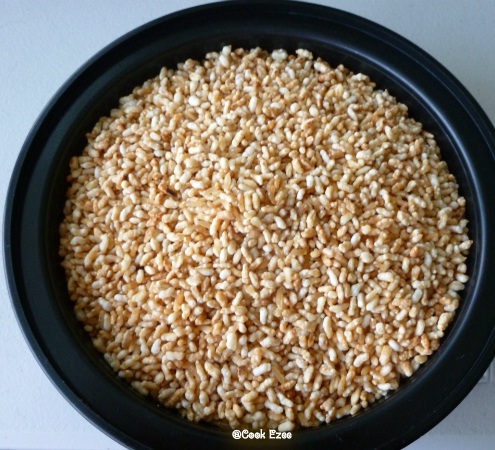 Dry roast the rice in medium heat till it is crisp and golden brown by taking care not to burn the rice. Set aside to cool. 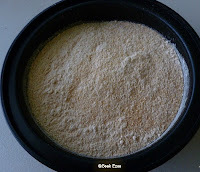 Grind it into a powder(it don't really have to be very fine powder, better of like 'Puttu Podi') and move into a big bowl. 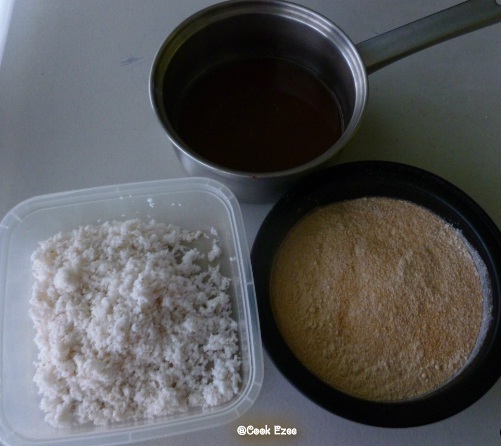 Now mix well the roasted rice powder and coconut with your hands. 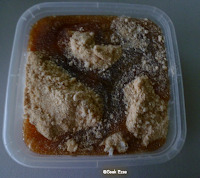 Pour the Jaggery syrup on top and mix well. Take a fistful of the mixture and make balls out of it by rolling it under the palm to make the surface as smooth as it can be. Serve immediately with a cup of hot Tea or warm milk for kids. Store them in air-tight container up-to two-three days. Since grated coconut is added it will not stay outside for long. You can refrigerate it in an air tight container for a long period of time but it surely taste better when served without being refrigerated as it is very soft and juicy. That is my hubby's favorite dish. I am made to carry a tin full of ari unda back to Bahrain from India. Now I can try make them at home for him. Thanx dear.